Larry Eugene Bolden, 69, of Bolivar passed away in Jackson on Friday March 29, 2019 after a short illness. He was born on October 18, 1949 in Whiteville to the late Willie Lee Bolden, Jr. and Helen Pirtle Bolden. His funeral service was held on Monday April 8, 2019 at 1:00 at Zion Temple Worship Center with Reverend William D. Young in charge of the service. Burial was in the Campbell's Chapel Church Cemetery-Bolivar and Dixie Funeral Home (www.dixiefuneralhome.com) was in charge of the professional service. Larry was educated in the Hardeman County public schools and the Tennessee Technology Center-Whiteville where he earned a auto mechanic certificate. He later completed truck driving school and was an over the road truck driver of more than twenty years. He accepted Jesus Christ at a young age and joined Green Grove MB Church. He later joined Campbell's Chapel where he served as a deacon. He was a veteran of the United States Marine Corp. where he served in Vietnam. He was honorably discharged in 1973. He was employed in factories in Hardeman County before starting his truck driving career. He enjoyed spending time with his family and had a passion for cars. 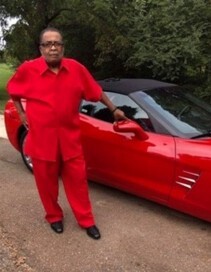 He was a member of the Volunteer Corvette Club of West Tennessee. He leaves to cherish his memory his loving wife Carolyn Franklin Bolden; his children, Jeffery (Deborah) Franklin, Anja (Ryan) Rivers, Nikia Godwin, and Jessica (Julius) Deberry; ten grandchildren and four great-grandchildren; three sisters, Mary Helen McNeal, Felicia Faye Bolden and Jennifer Kaye Bolden; four brothers, Carlos, Steven, Rodrick and Gary Bolden; a host of other relatives and friends that will truly miss him.